i've just acquired this guitar. 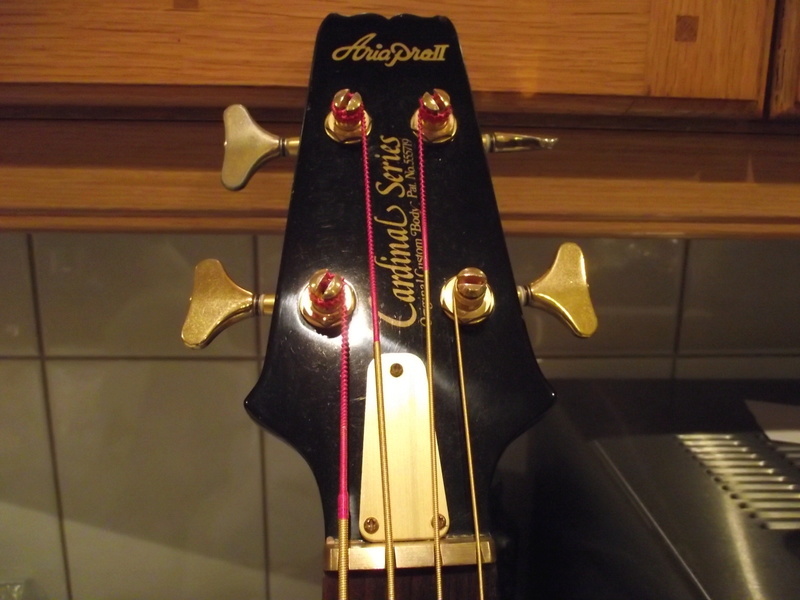 the body and neck are fairly well worn, with a few significant dings. the electrics are gone, save the string retainer ground wire. i'd appreciate any advice that anyone might offer regarding restoration. in particular, i note that the saddle string length adjustment screws for the 1st, 2nd and 3rd strings are longer than for the 4th, 5th and 6th strings. i suspect this is wrong, as they cover the through-body string holes and the return springs are no longer to make use of this additional screw length. am i correct or is there, in fact, an explanation for this apparent quirk? also, i'd like to restore the original body and neck finish, rather than completely re-doing them. they appear to be finished in black lacquer. is this correct? this forum does seem to be a little on the quiet side. nevertheless, i'll persevere. it appears that the intonation screw length was likely selected at manufacture. i've seen other westone bridges now with different combinations of long and short screws. now, i've been offered a set of westone UBC pickups from a spectrum ST, also being referred to as westone maxxon. i'm wondering if these would be sympathetic to my restoration. in addition, i need a wiring diagram with component types. As for UBC pickups, be aware that the term refers to specifications which changed considerably over time. If you see "MMK45" you're doing well, with an output around 11-14K. If there's nothing on the bottom or, it's a solid plastic then you have the "inferior" variety which measures roughly 6K. Most of us swap them out as fast as we can. The finish on the Westones is not lacquer but a catalyzed polyurethane and is tough as nails. It is prone however to chipping but can be repaired using the drop fill technique. from your description, the pickups were the 'inferior' variety. 6.5K Ohms. nothing on the back. the seller wanted £60 for the pair. i've seen the 'website entry'. unfortunately, it doesn't give me the detail that i need. i'd be grateful for more information on the 'drop fill technique'. The finish is originally just a black base coat, no shine, dull, satin. Could refinish in satin black can spray(cheap) or use a 2 pack black base coat. A car paint shop might mix up a can or two of base coat if you haven't the use on a compressor. As for the UBC p'ups stay well away they're crap. If they look like these on the bottom or have a plain metal bottom(as mentioned) with funny looking crosshead pole pieces. I've a set of very decent replacement pup's going cheap if interested. Wired for coil tap. Was typing as you posted your latest message. £60!!! taking the P*SS. Just playing on the Westone name. monkey wrote: ...the seller wanted £60 for the pair. Friggin' bandit! Unless you're dead set on originality, walk away from this "deal". There are many, many fine replacement pickups on the market that will do just fine and leave the originals panting for breath. ...i'd be grateful for more information on the 'drop fill technique'. Google is your friend. Lots of info out there. You can start will THIS POST. UBC pickups were never fitted to a Thunder Jet. 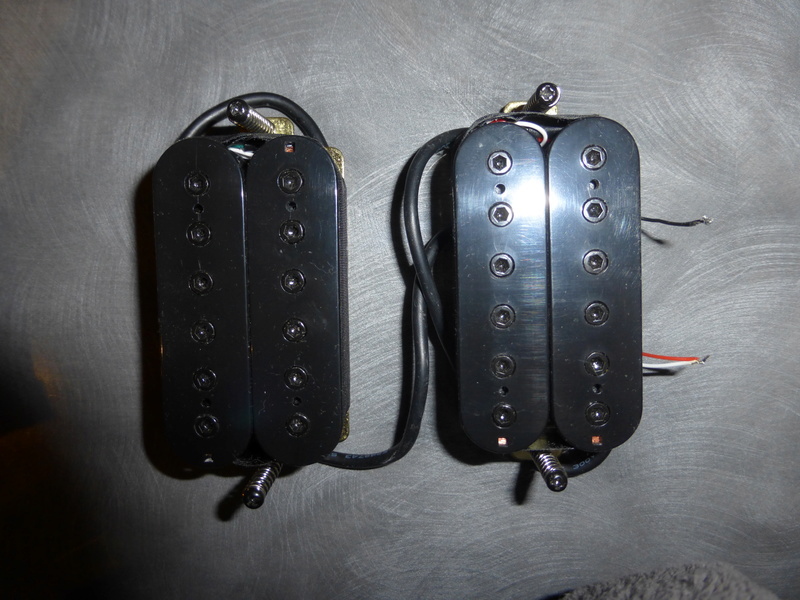 Magnet-F450, Hammer I and MMK 45's are all the same pickup, just sales blab! All are marked MMK45 on the bottom and are all identical internally. Fitted as standard on the Thunder Jet. As Barry mentioned. Plenty excellent replacements out there. But. . .do not put the UBC's in that baby!! my apologies for the late reply. i care for my father, who has dementia, so that has to take priority to everything else. i've heard nothing more from the seller of the UTC pickups since i asked what the difference was between them and the MMK-45 type. my intentions to restore this guitar as original are fading fast. apart from the availability of the parts, the cost far exceeds what would be the value of the guitar when complete. i guess that's why people strip them in the first place. i'm starting to accept that i need to be pragmatic and do something more cost effective and, possibly, interesting too. i'd like to know what type the volume and tone pots were and any passive components used. that would be helpful. otherwise, i'll just have to make an educated guess based on other similar guitars. i'm seriously toying with the idea of doing away with the pickup selector and using a blend pot instead. obviously, i'd have to reduce the hole diameter, however, a customised washer could do that for me. now, i've not had time to chase up the link that Barry posted about restoring the finish of this guitar. nevertheless, i will mention that there are a couple of dings in the headstock where it looks like the polyurethane has 'delaminated' from the basecoat underneath. i'll post some more details here as and when i have time and have actually made some meaningful progress. Mate... of course your dad comes first!! The pots would have been 500kΩ, 1 x A taper, 1 x B with a cap across tone pot lugs - probably 47μf but Damian will know for sure! Selector was likely a bog standard box 3 way and if there was a coil split option, the pots were most likely push-pull. The finish is problematic in that personally I hate matte black finishes and am, in fact, not too keen on metallic black either, so I'd probably completely re-finish in something I really fancy. You, however, might like matte black and so you'll need to know how to restore, or re-do it! I don't paint mine as I know my limitations and have access to a very fine airbrush artist here close by who has always seen me right, but the fact remains that you have been presented with an opportunity to build yourself a custom guitar: how cool is that?! My best wishes for you and your dad monkey. I know what a stress it is looking after aging parents with health issues. Hey, your guitar's going nowhere, it'll still be there when you're ready. Look upon it as a nice hobby/distraction. Restoration can be a big job depending on your skill level and available funds but in the end it is very rewarding to create an instrument that you really love. Lots of good folks here to help when you decide what you want to do. Just sing out. ... they're 1mm diameter wider than the originals and the same height. hopefully they'll look alright. i've also bought the 3-way switch. next is the jack socket. i've now bought a set of active pickups, so i'm becoming more and more committed to a custom re-build. not what i'd wanted but i suppose this will be far more interesting. the jack socket, of all things, is proving a little difficult. i wanted to use a barrel type but they're too wide. the reason being that i don't want a hex nut. so, i'm now looking for a round nut, like would be used on a pickup selector switch, if such things exist. i'm not really wanting to do anymore 'damage' to this guitar. in fact, i'm trying to resist the temptation of relocating the strap buttons to the back. i might still be able to use a barrel type jack socket if i turn down the thread and use some sort of clamp to hold it in place. but i'll only do that if i can't find a suitable 'round' nut for a standard jack socket. i spent a fair while last night trawling eBay looking for a black stereo jack socket with a 10mm thread. all i could find was one for a marshall amp with a plastic body. the ones that are more commonly used (that go through a metal mounting plate) have an 8mm thread, which would give a very sloppy fit. is that what was originally used on this guitar? ... thanks. that is indeed an 8mm thread. mine needs to be stereo for the active pickups. i think the other channel is used for battery charging, though i haven't confirmed this. i'm just going by what the seller has told me. 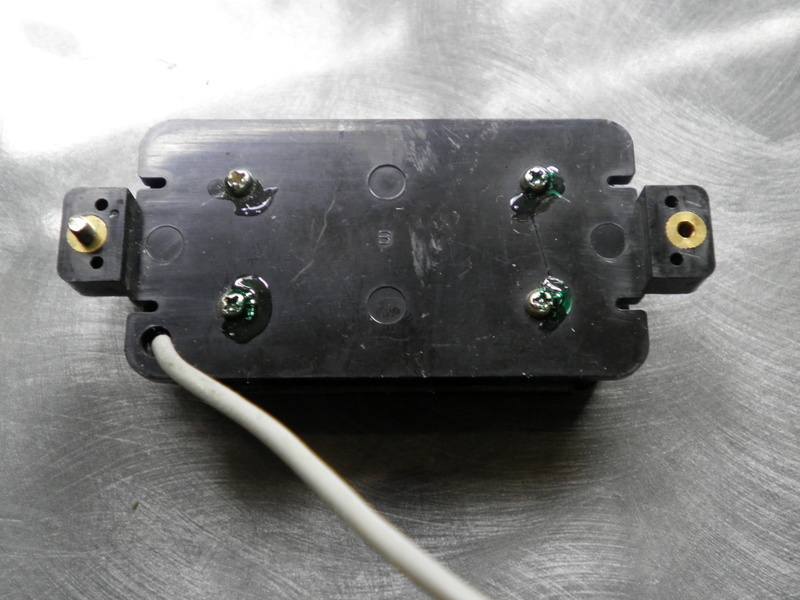 the stereo jack is used so that the battery is disconnected when the cord is removed from the jack. op gittarasaurus wrote: the stereo jack is used so that the battery is disconnected when the cord is removed from the jack. ... i see. thanks for that. i haven't got the active pickups yet. i only bought them last night. they were relatively cheap. i guessed it might be for charging because i know that line 6 do this on their spider V (i've got a spider IV 30) amps for the relay G10 wireless transmitter. i think i'll be able to charge the battery by connecting the positive terminal via a series diode to the output and using a stereo jack plug with the second channel open circuit. i'll use a redundant diode circuit, just to be on the safe side. i might also need to decouple the pickups from the output via a suitably small value capacitor. Talk about getting to complicated. Whats wrong with the 'normal' way works for just about all and sundry. 'hate active pups with a passion. Westbone wrote: Talk about getting to complicated. ... in my former life i was an aerospace engineer designing safety critical control systems. this shouldn't be beyond me. and it gives me something to think about. certainly, i could've just done this the normal way but it wouldn't have been very challenging. had i been able to re-build this as original, as i'd wanted, this wouldn't have been a possibility. but that's not going to happen now. so, to me, this is just making the most of an outcome that i hadn't really wanted, if that makes sense. Barry wrote: 'hate active pups with a passion. ... in theory, active pickups ought to give a cleaner and crisper sound. whether that's true or not, i'll have to wait and see. however, i will say that it appears that much of the tonal qualities of guitars that are sonically pleasing seem to stem from distortions of one sort or another. for example, ideally there oughtn't be any contribution from the body of a guitar to the tone. it ought to be absolutely stable. yet tonewood deliberately introduce resonances that the pure tones of the strings would lack. Yep, you can fasten actives to a slab of mahogany, a barn board, or a broom stick and you'll get the same sound. Passive pickups do take on tonal colouring and even some microphonics that are not present in the actives. I got hot under the collar when I worked at the guitar shop one day when a young guy brought in a beautiful Les Paul equipped with P90's and wanted them taken out and replaced with EMG's! I told him it was not what I'd recommend but it was my job so out they came. He returned a few months later and asked to have the P90's put back in. He could hear and feel the difference. Is that why you choose a Thunder JET! ... i think that JET is a reference to the colour. i used to trawl eBay looking for guitar bodies to use as project builds. i've now got so many projects that i'm currently deliberately avoiding that temptation. and that's how i found the thunder jet. it was essentially just a body and neck. now, it has to be said that i shouldn't have bought it. i had enough projects to be getting on with and i'm somewhat over-spent on my monthly budget too. but it 'called' to me. difficult to explain. i'm not mad keen on painted guitars. and i'm not mad keen on black either. as such, quite what it was that i saw in the thunder jet is difficult to say. i'll put it like this. i have a japanese tea service that my mother bought for me many years ago from an antiques shop. it's black lacquered wood with hand painted scenes in the classic japanese style. i used to go into the shop and just look at it every time we were up town. this guitar has something of that quality about it. it just entranced me. and then it arrived, i put the body and neck together, strung it. set up the bridge and tuning and just fell in love with it. Barry wrote: Yep, you can fasten actives to a slab of mahogany, a barn board, or a broom stick and you'll get the same sound. Passive pickups do take on tonal colouring and even some microphonics that are not present in the actives. ... i hear you. if i don't like them, they're coming out. Not keen on black guitar neither unless a Gilmour Strat. Black's a funny 'ole colour ,eh. Or technically speaking, the absence of any colour I guess. It can look like an absolutely stunning jewel, or a piece of rubbish driftwood the dog dragged in from the beach. More often than not it's the latter, especially when older. But for a beautiful Matsumoku execution of Black, check out the Aria Pro II series "Black and Gold". Swapped a Spectrum(black) for this CS bass b+g. Even has gold strings. A little improvement over all black. my favourite colour is translucent purple. i've got an encore KC3 strat in that colour with a white pearloid pickguard. i've also got a basswood strat body with flame maple veneer top in a sunburst in that colour which will have an amber neck and brushed stainless steel pickguard, when i get around to doing it. the pickguard needs a bit more design work around the bridge. it's going to be quite different to the standard strat pickguard - more of a control cover, really. 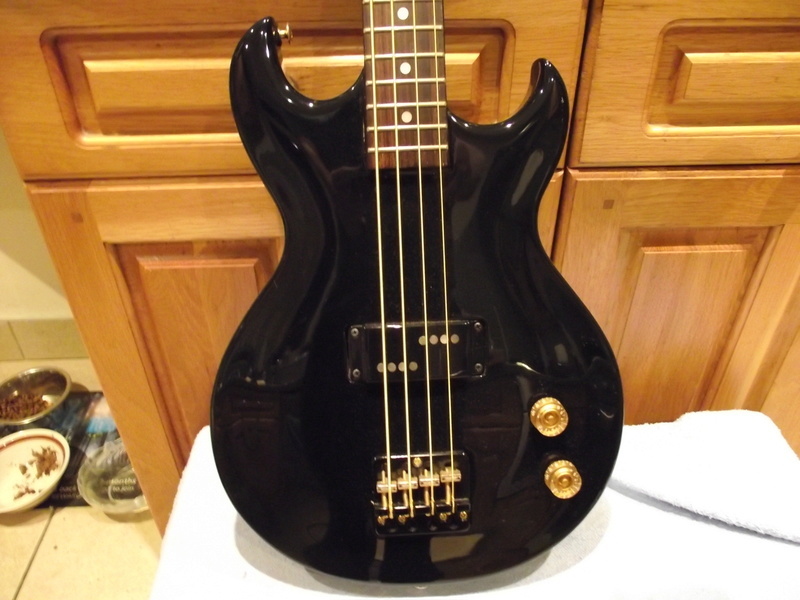 Westbone wrote: Swapped a Spectrum(black) for this CS bass b+g. Even has gold strings. A little improvement over all black. Now see, that's what I'm talking about! ... i wanted metal, rather than plastic, ones. there were only two kinds on eBay with mounting holes of 83x37mm. the others were nickel plated brass and quite expensive. anyway, the bridge one fits fine. the neck one less so. the two rear holes are about 1.25mm forward of where they need to be, enough to mean that the screws won't go in remotely straight. so, i'll plug and re-drill the holes later some time. i'm having second thoughts about the active pickups. basically, they won't have a centre tap and no centre tap means no push/pull tone control. somehow, that doesn't seem quite right, even though this re-build isn't going to even pretend to be original anymore. I don't know what brand of active pickup you're thinking about, but EMG does make a version with both single and dual coil output if you're interested. Bloody pricey though. they're a tesla AH-3 active humbucker set. as i mentioned, they were relatively cheap. i'm not even sure what i'll think of them yet. the active puckups are here. 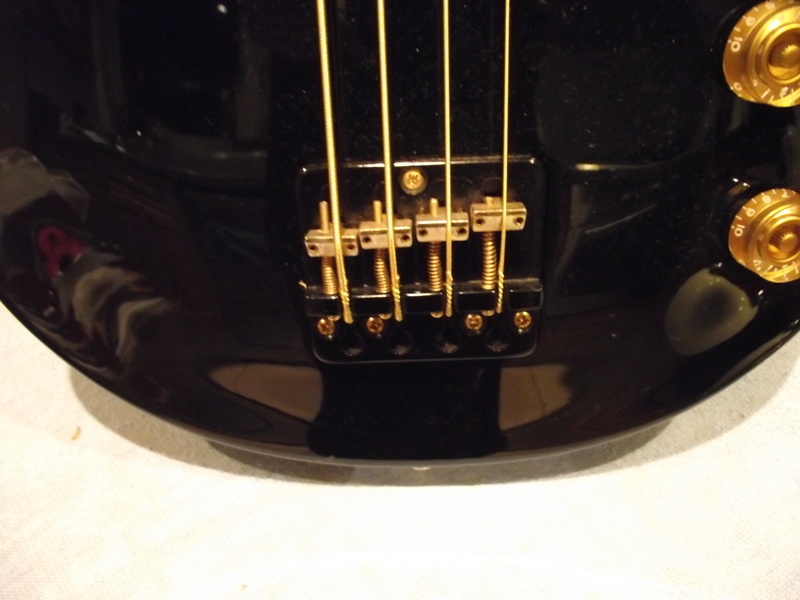 neck and bridge humbuckers, 2 pots, a battery connector and a stereo jack (in chrome with black hex nut). no wiring. i'm still undecided about using them. i guess that i should at least try them. my only other though here is to make my own. i've got a few thoughts about what i'd like to try but i think that'll be too much of a long pole. i don't want to be waiting forever on completing this. i filled the two back holes for the neck humbucker surround last night. i was a little undecided as to how best to do this. i could've plugged them with the ends of a wood cocktail stick. instead, i decided to mix up some filler made of sawdust and wood adhesive and pack that into them. the humbucker surrounds are actually quite attractive. they're not so much a jet black as more of an anthracite. i'm hoping to get some knobs to compliment them, colour wise. the screws that i bought for fitting the humbucker surrounds are much too small. it oughtn't be a problem getting something better. the same can't be said of the screws for the humbuckers themselves. the only ones that i've so far found on eBay are dimarzio and, for screws, they weren't exactly cheap. I have used the metal mounts before and they are really quite nice. I put a chrome finished pair on my Urchin and they look stunning against the "butter cream" finish. I hear ya on the replacement screws. Oddly enough they're one of hardest things I have found to track down locally. There is always something not quite right: gauge, head, length, material. You'd think they would be easy to find. Barry wrote: I hear ya on the replacement screws. Oddly enough they're one of hardest things I have found to track down locally. There is always something not quite right: gauge, head, length, material. You'd think they would be easy to find. Oddly enough, my local fastener warehouse doesn't stock anything quite like pickguard screws or pickup height adjustment screws and a guitar shop, or the likes of Stewmac, are often the most efficacious source! DiMarzio are a little pricey but when they've got what you want - and you cannot find it anywhere else for love nor money, then you just pay up.... ask me how I know!! Key word here is "locally". ... "Black[out of stock]" ... eek!!! Barry wrote: Key word here is "locally". Use those guys for a lot of gear, quality! Receive stuff in a week or thereabouts and they're a great deal cheaper that f'king Stewmac. progress has been rather slow of late. i'm stalled on the humbucker screws. strictly speaking, i have a chrome set that i could use or swap out a black set for on my LTD EC-50. i just don't have the enthusiasm for doing things twice, so i'm waiting to get another black set. i've bought a wiring harness, complete with pots, switch and jack. this seemed the most pragmatic approach. the most obvious omission now is the control cover. i've looked on good old eBay but nothing there looks like a fit. i've even tried to get some pickguard material from a previous supplier, to no avail so far. so, is this a standard part or will i, indeed, need to make one? now, i will digress a little and just mention here that my plan for the LTD EC-50 is to re-terminate the humbucker wiring to allow for centre tapping. i have to confess that i'm not a big Les Paul fan. the arc around the pickup selector switch just looks wrong to me and the jack socket is in completely the wrong place for my mini-amp. also, the single tone pot has severely frustrated my attempts to do something interesting with the humbucker coil configurations. i think that i now have the answer to that - 4 volume pots. ... it might if i put a push/pull on the tone control to switch the humbuckers between parallel and serial wiring, however, i haven't quite got my head around that yet. the three way switch would need changing and the humbucker ground connections get a bit complicated in serial with that kind of pickup selection. it'd be easier to use a rotary selector, though perhaps a bit odd looking. ... the knobs were the reason that i couldn't do this re-build as original. i nearly did a deal with the person that was going to sell me the UBC humbuckers to secure a pair of original knobs but he wanted £90 for them plus a pair of MMK-45s, one of which had a coil out. at that sort of money, as i pointed out to him, i might as well put it towards a complete guitar. also, he wanted to do the deal ex-eBay, and that was the point at which it fell through. ... they're roughly the same size as the originals. when they actually turn up, i'll know if they look alright. at the moment i'm thinking that they might look a bit clumpy.